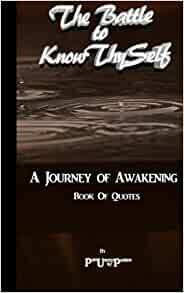 The Battle to KnowThySelf reflects a journey of Awakening. It is a compilation of quotes inspired from over a decade of deep soul searching, analysis of experiences and acquisition of new knowledge. These words are universal. They connect with the people to convey a message of growth and awakening. It will inspire your own evolution into consciousness to become your higher self and true example of change your children need. PUP is an entrepreneur, artist, activist, and visionary from Hartford, CT. His name stands for Pain United w/ Passion. PUP creates powerful music and poetry which is geared towards consciousness and expressing life experiences. He uses his lifelong connection with music to portray his own evolution and awakenings. With themes of empowerment and knowledge, he pulls mainstream entertainment in a new direction to inspire youth artists and thinkers. On a mission to awaken others and create a better future for our children, he leads by example. PUP works vigorously to make a difference, uplifting people with music conveying important messages from his own DoloMission Entertainment Studio. He has collaborated with numerous artists, including Qu!n and Pharaoh Mook, recording and engineering their projects “Est 88” and “Hunger Games”. PUP has also created his own projects, The Next Dimension and The Battle to KnowThySelf. PUP serves his community with the nonprofit organization 4Unity Corp and creates events as a platform for expression such as DME Cypher Sundays and Speak Your Truth. He continues to expand his outreach in the community by participating in other conscious functions spreading knowledge, such as Kemet Maroon’s “Vital Konsciousness” and Alphonso McGriff’s “Conscious Conversations”, to name a few. PUP and 4Unity Corp recently partnered on a mission to spread awareness about Alzheimer’s disease. This is a cause near and dear to his heart, as his mother is battling this condition at the young age of 53. He continues to stay positive and motivated, channeling his creativity through various forms of expression. He’s taken his DoloMission to Sa Neter TV, a prolific black empowerment online network based in historical Harlem, New York. PUP has become an official part of the House of Konsciousness family. He is the House of Konsciousness Conscious Artist, creating and performing music at their events. PUP also did a presentation for his album, The Battle to KnowThySelf in an innovative way, decoding his lyrics to magnify the valuable messages for the people. But it doesn’t stop there. PUP is creating a DoloMission movement, with a t-shirt line, music album, video lyrics series and now his first book. And there is more to come. PUP will continue to push forward to inspire others to fulfill their purpose, “changing the consciousness of his love ones one conversation at a time”.